BIO ~ Aussie is a neutered male Australian dingo who was born in 2012. PERSONALITY ~ Aussie is shy and sweet. While Glacier greets people at the fence line right away, Aussie and Uluru can usually be found a few feet back. The two often spend their time together, whether they are relaxing or playing, sharing a brotherly bond that few rescues at our sanctuary have. RELATIONSHIP ~ Aussie lives with his two brothers, Glacier, and Uluru. They are on the tour path and usually come to the fence line to greet guests. LIKES ~ Aussie loves his brother Uluru more than anything else, and they spend most of their time together. Aussie also enjoys chewing on things – bones, sticks, his brother’s tails – you name it! DISLIKES ~ Aussie dislikes when Glacier picks on him. When Aussie is trying to relax, Glacier is usually extra pushy, sometimes even jumping on top of him while he tries to sleep! FUN FACTS ~ Aussie is pretty shy, but he does occasionally come up to meet new visitors. He will even kiss his guests, like the time he met famous author, George R. R. Martin! WISH LIST ~ Aussie loves to splash in the water, but we would love donations to get him and his brothers a more permanent water trough to splash in. Aussie is Still Looking for Sponsors! AUSSIE’S STORY ~ Our four dingoes were displaced after a couple’s conservation efforts did not go as planned. 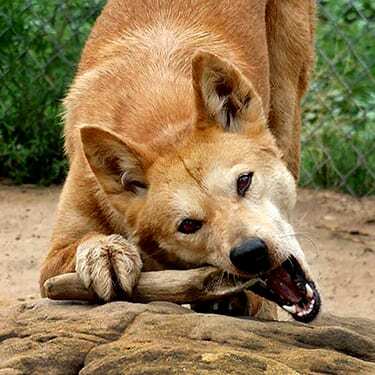 Kooyong and her mate Buckley were a breeding pair of pure dingoes who came from Dingo Discover and Research Centre in Australia, which has been an official conservation organization since 2007. 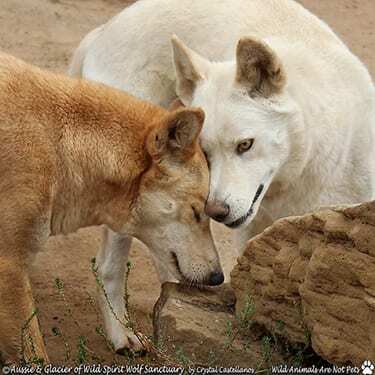 The Centre finds zoos and sanctuaries outside of Australia, who are willing to care for a breeding pair of dingoes and their offspring to help ensure that the species survives. Occasionally, a breeding pair goes to a private home, like Kooyong and Buckley who went to live with a husband and wife in Florida. They gave their dingoes great care and made sure they had plenty of love, socialization and a rich diet. Kooyong had a litter of six pups. Although the whole dingo family had great care, the human family went through a rough patch. The husband tried to sell Kooyong’s pups and quickly found out that it was illegal. As a result, he left, taking all their funds and left his wife and her son along with all the animals. Soon after, Buckley and his three sons had a terrible fight, that resulted in Buckley being euthanized due to devastating injuries. With tremendous sadness, the woman decided her dingoes needed placement in new homes. Two of Kooyong’s pups found a home at a zoo. Kooyong, Aussie, Glacier, and Uluru had a terrific foster home in North Carolina until Wild Spirit staff could make their way to bring them to their permanent home at WSWS. The family is now spayed and neutered which has helped keep peace amongst the boys, but as a result our dingoes are no longer part of the conservation program.